The most useful things in your first aid kit are knowledge and practical skills. Our First Aid courses are built around practical learning that is relevant to you and will give you the confidence to use your skills when needed. We can deliver all our courses at your request at Bewerley Park, East Barnby or at a location that suits you. A Group Booking is for 6 to 12 candidates all from the same organisation. Open courses that are available to individualsrequire a minimum of 6 participants to run. QNUK Level 3 Award in Forest School First aid (RQF) – 2 day 16 hour training. This revolutionary qualification is intended for those working as forest school leaders and in outdoor environments with children. It has been specifically developed to meet the needs of forest school leaders who may otherwise need to undertake up to 3 first aid qualifications to meet forest school and workplace requirements. It is the UK’s ONLY regulated forest schools first aid course. It is mapped to the Level3 Emergency First Aid at Work, Level3 Outdoor First Aid and Level3 Paediatric First Aid meaning you could get 4 certificates for 1 course! There is of course no need to do this. The course automatically covers all 4 qualifications. QNUK Level 3 Award in Responding to Anaphylactic Reactions (RQF) – 3 hour training. This qualification is intended for those who are working with individuals who have been diagnosed with anaphylaxis and who may need medication to be administered to them. This qualification that indicates an individual can undertake a specific role in the workplace and that may be relied upon by employers. QNUK Level 3 Award in Activity First Aid (RQF) – 2 day 12 hour course. This qualification is intended for those who require a first aid certificate tailored to sports coaches and instructors. The course builds on the basic course content of the emergency first aid at work and includes topics such as spinal injuries and fractures. It is mapped to the Level 3 Award in Emergency First Aid at Work, so on request for an additional minor cost a EFAW certificate can be issued as well. QNUK Level 3 Award in First Aid at Work (RQF) Initial Training – 3 day 18 hour training. This qualification is intended for those who require a first aid certificate for higher risk work environments such as factories or warehouses and to act as a lead first aider in larger organisations with more than 100 employees. For regulatory purposes, successfully completing the Level 3 Award in First Aid at Work will enable the candidate to act as a first aider in the workplace under the H&S (First Aid) Regulations. QNUK Level 3 Award in First Aid at Work (RQF) – Re-qualification – 2 day 12 hour course. The Level 3 Award in First Aid at Work is a two-unit, two-day course for those with a current FAW certificate that needs renewing. QNUK Level 3 Award in Emergency First Aid at Work (RQF) – 1 day 6 hour training. This qualification is intended for those who require a first aid certificate for lower-risk work environments, such as offices and shops and/or organisations with fewer than 100 employees. For regulatory purposes, successfully completing the Level 3 Award in Emergency First Aid at Work will enable the candidate to act as a first aider in the workplace under the H&S (First Aid) Regulations. QNUK Level 3 Award in First Aid at Work +F (RQF) – 3 day 20 hour training. This qualification is intended for those who require a first aid certificate for undertaking the role of first aider when working in higher risk job roles on Forestry Commission Land. Developed specifically to meet Forestry Commission first aid requirements. For regulatory purposes, successfully completing the Level 3 Award in First Aid at Work +F will enable the candidate to act as a first aider in the workplace under the H&S (First Aid) Regulations. At time of writing this is the ONLY regulated qualification for work on Forestry Commission land. QNUK Level 3 Award in Emergency First Aid at Work +F (RQF) – 1 day 8 hour training. This qualification is intended for those who require a first aid certificate for undertaking the role of emergency first aider when working on Forestry Commission Land. For regulatory purposes, successfully completing the Level 3 Award in Emergency First Aid at Work +F will enable the candidate to act as a first aider in the workplace under the H&S (First Aid) Regulations. At time of writing this is the ONLY regulated qualification for work on Forestry Commission land. QNUK Level 3 Award in Paediatric First Aid (RQF) – 2 day 12 hour training.Successful completion of the training programme will provide candidates with the essential knowledge and skills to undertake the role of paediatric first aider in a variety of childcare settings. In particular, it teaches basic life-support skills and cardiopulmonary resuscitation, to enable candidates to deal with life-threatening emergencies, as well as how to manage common paediatric illnesses, injuries and emergencies. This qualification has been developed to meet the requirements set out in the Department for Education’s statutory framework for the early year’s foundation stage for first-aid training in Ofsted-regulated childcare settings. QNUK Level 3 Award in Emergency Paediatric First Aid (RQF) – 1 day 6 hour training. This qualification is intended for those who require a first aid certificate for working in an early years setting, however, the setting should ensure that they also have enough staff with a 2 day Paediatric first aid certificate as required by the Ofsted/EYFS guidance. This qualification can contribute to the required 12 hours of training if candidates subsequently wish to attain the full Level 3 Award in Paediatric First Aid. 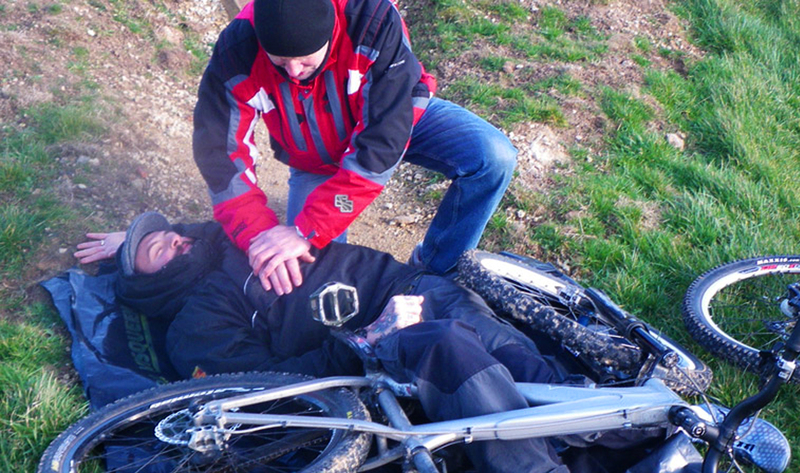 QNUK Level 3 Award in Outdoor First Aid (RQF) – 2 day 16 hour training. This qualification is intended for those who require a first aid certificate that fulfils the requirements for most NGB award providers and the requirements for IOL Band 3 Outdoor Instructors. This means an unsupported adventurous activity leader typically operating in situations where help is generally under 2 hours away, e.g. outdoor instructors, outdoor learning practitioners, mountain leader, D of E assessor, bushcraft instructor. Includes immersion in water training. It is mapped to the Level 3 Award in Emergency First Aid at Work, so on request for an additional minor cost a EFAW certificate can be issued as well. QNUK Level 3 Award in Emergency Outdoor First Aid (RQF) – 1 day 8 hour training. This qualification is intended for those who require a first aid certificate to fulfil the requirements for IOL Band 2 Outdoor Instructors. This means a supported outdoor practitioner typically operating within defined grounds and close to immediate support, e.g. activity instructor, sports coach, school teacher, remote rural visit leader, etc. Includes immersion in water training. It is mapped to the Level 3 Award in Emergency First Aid at Work, so on request for an additional minor cost a EFAW certificate can be issued as well. QNUK Level 3 Award in Responding to Incidents with an AED (RQF) – 3 hour training. This qualification is intended for those who do not want or need to be a first aider, but require training in the used of an AED. It provides learners with the knowledge, skills and understanding to enable them to use an automated external defibrillator and perform basic life support.PLEASE NOTE – AED training is included in all our first aid courses as standard. It can be used by staff working in Doctors and Dentists practices as part of their annual training requirments. About the Training:We believe in exciting and practical training courses, and aim to adapt the course to the participants as much as we can. There will be a high level of practical and interactive work on the course. Please be prepared to be involved and active! All courses will involve elements of work on the floor, so dress appropriately! For the activity & outdoor courses, dress for being outside in possibly wet & muddy conditions.All courses involve on-going assessment of your skills, formal assessment of your skills and multi choice question paper(s). A willingness to listen, learn and actively participate!If you have any further questions, please email the Centre before the course. The North Yorkshire Outdoor Learning Service has all of its First Aid Courses externally validated and accredited through Qualifications Network. This is underwritten by OFQUAL. This means that all of our courses are nationally recognised and delivered to RQF standards unlike those of the voluntary aid and first aid organisations who self verify! Following recent work, several of our courses are now mapped to each other. This means that you can do one course and receive a certificate for another course as well (subject to paying the extra certification fee). For example, Level3 Forest School First Aid is mapped to L3 Emergency First Aid at Work, L3 Outdoor First Aid and L3 Paediatric First Aid meaning you could get 4 certificates for 1 course! There no need to do this unless your organisation requires it. The course automatically covers all 4 qualifications. Evidence for this is available – Please enquire when booking if any of these options are of interest to you.